I have always liked sunflowers! 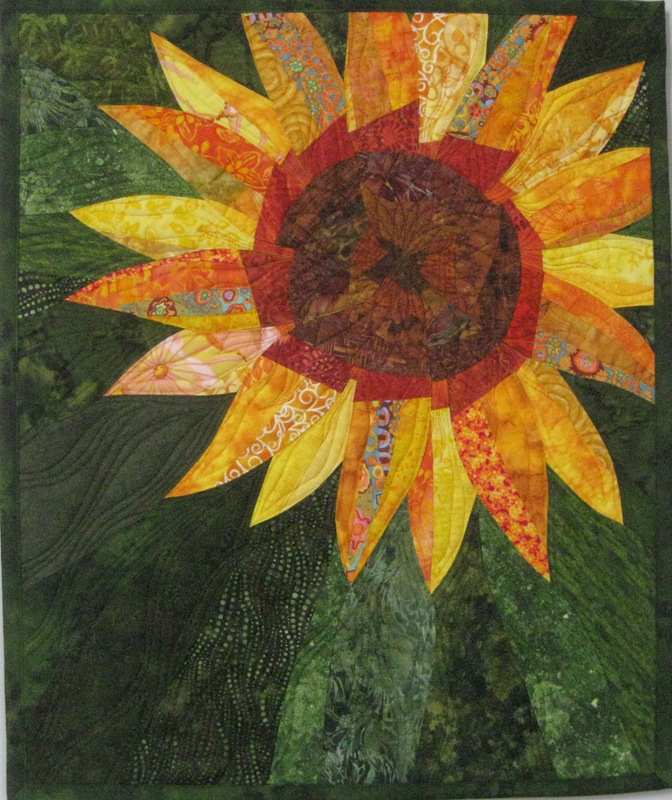 There is a plethora of sunflower photos, paintings, and wall quilts out there but I wanted to try my hand at my own interpretation of a sunflower quilt. I have made some “flower” quilts which have very similar piecing for the petals, designs for which I have made my own templates but these precise and repetitive designs are not my favorites. I like variability. I like my quilts to have some unpredictability to them, different colors, different sizes, different ways to construct a design. 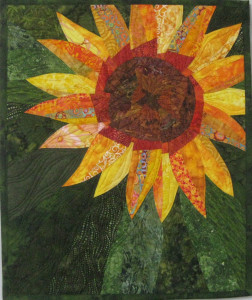 My “Wonky Sunflower” art quilt, is my first attempt at my own design of a sunflower. The center is not perfectly round, the colors and sizes of the petals vary and the background is a composite of many different greens. 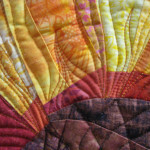 I think the variability of colors and patterns adds depth and texture to any quilt. I finished piecing this quilt and couldn’t decide on how to quilt it. Quilt stitching must add something to a quilt, not just attach the top to the back and batting. 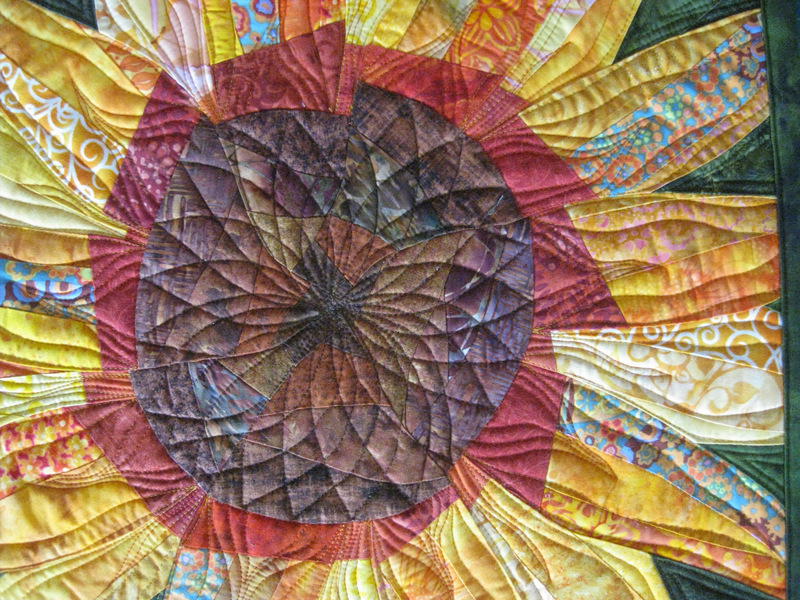 I finally decided, a bit against my usual approach, to quilt a specific design into the rather hodge podge mosaic piecing of the middle of the sunflower. 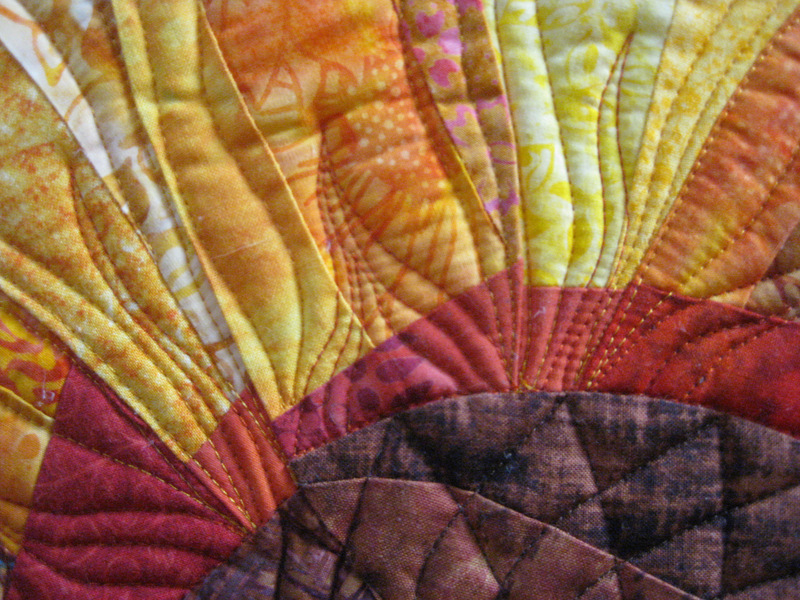 I liked the contrast of the piecing and the quilting. For the petals, I did some experimentation on a scrap petal first to determine the best thread color. It is easy to select the wrong colors, mostly by going too dark. 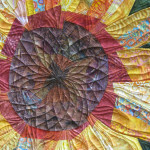 This quilt had a strip of rust at the base of each petal and I wanted to enhance that with some free motion stitching. When I tried a rust thread though, it was too dark. I tried an orange thread and it was just what I wanted…something more subtle. 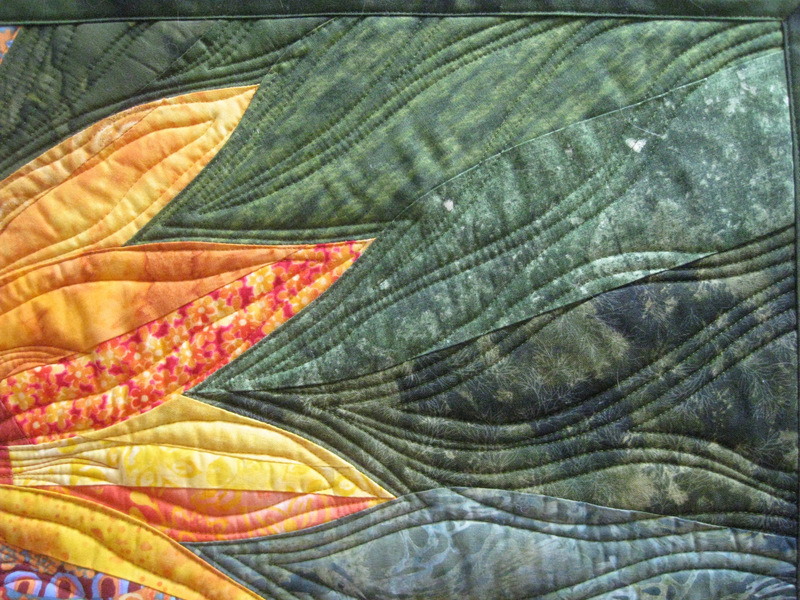 It is easy to pick too dark a thread and then that dark thread draws your eye away from the totality of the quilt. 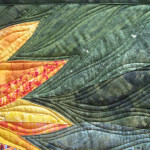 Experience tells me to practice on scraps and heaven knows…I have lots of scraps!! For the background I debated about an overall stitch design as filler but I settled on the irregular curved lines with open areas. At first I planned to fill in the variable and irregular open areas I created with the curved stitching but when I finished the curved stitching I found I liked the effect. Again, I felt that adding a different free motion design as filler throughout the background would draw your eye from the flower itself. The background as it was worked as a background with some texture and variety of color but not as the eye catcher of the quilt.